Don't Start a Food Truck. Launch an Empire. Food Truck Empire is here to inspire and help you run a more profitable mobile food business. Andrew and Claire Bowen are on a mission to stop independent coffee shops from failing. While employed in the healthcare and retail sectors, Andrew and Claire Bowen got the idea to start a coffee shop…. Jacksonville, the city of known for its beaches on its Atlantic coast and its rivers is the most populous city in Florida. The city is known for such since it was consolidated in 1968…. The goal of FoodTruckEmpire.com is to become the ultimate resource for starting a food truck. We’ve got some ground to cover before we can achieve that lofty benchmark, but we’re getting closer to making this a reality each week. Since starting this blog in 2013, we’ve interviewed dozens of entrepreneurs to pull out the lessons that help future and current vendors make more money and operate more efficient businesses. If this is your first trip to FoodTruckEmpire.com… Welcome! Below is a list of some of our best content on how to start a food truck. If you can’t find what you’re looking for please reach out to us directly on Facebook. We’re always working to develop more and better content for our visitors. Food Truck Case Study – Want to know what it’s really like to build a food truck business from start to finish? In this case study with Anthony Salvagno, we follow along Albuquerque based S’witch It Up in real time as they launch their mobile food venture. The Blog – The blog really is the heart-beat of FoodTruckEmpire.com. This is the spot we published weekly podcast interviews with culinary entrepreneurs and other awesome content. Get Funding – One of the frequently asked questions we receive from readers is how to get funding for a truck or trailer. If you’re in this situation, check out our guide on the seven most common ways entrepreneurs are acquiring capital. Best of all, two of these options never need to be repaid. Vendor Services – If you’re interested in buying or selling a food truck, browse the Start A Food Truck section of our website. With thousands of mobile food entrepreneurs visiting our website each month we make connecting with the right prospective buyer or seller easier. Food trucks offer the opportunity for entrepreneurs to forge their own path, build a brand serving food they love, and achieve financial freedom. But there is a catch. Operating a restaurant on wheels is a lifestyle business that requires an incredible level of dedication and hard work to get going… It’s not for everybody. If you’re serious about building a mobile food brand these are the high-level steps we strongly recommend completing before launching a mobile food business. This is by no means comprehensive list. If you’re looking for something more detailed, check out our food truck case study here for step-by-step instruction to getting started. Write a Business Plan. – This is not a waste of time. You’re business plan should articulate the brand of your truck, how you want to be perceived, how you plan to get business (parking downtown, securing catering gigs), and make rough profitability estimates. If you haven’t completed this step, download a template here and listen to this interview to learn the benefits of going through this process. Develop a Menu. Identify the food items you plan to serve. This will determine the cooking equipment you need and will have an affect on the size of truck needed. Learn Local Laws. The rules and regulations for operating a mobile food business legally can vary widely from city to city, even if their located just a few miles apart. Contact the city hall of each city you plan to operate in regularly to ensure that you’re future food truck is up to snuff for the area you’ll be operating in. You may also need to purchase special permits for some areas. Contact Us! Congratulations on developing a business plan, menu, and researching the rules of your area. This is a lot of work, but it will pay dividends in the future. Next, contact us for help build your truck no matter where you’re located in the United States. 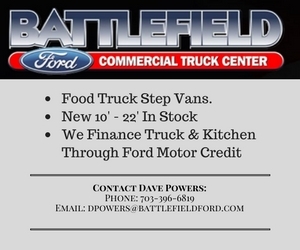 We can even help with finalizing the concept of your truck at no cost to you and secure discounts with vendors. We can’t wait to learn about your new business.